Well, we took it easy today. Sort of. 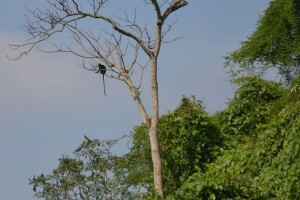 We hung around the Phong Nha Farmstay until after lunch, then went out to look for the rare Hatinh Langurs that live in Phong Nha National Park. We spent a while chatting with our host, Ben, a solid Australian chap who moved out here with his Vietnamese wife maybe ten years ago and built the Farmstay. At the time it was pretty much the only place to stay near Phong Nha and the National Park itself wasn’t open to visitors at all. 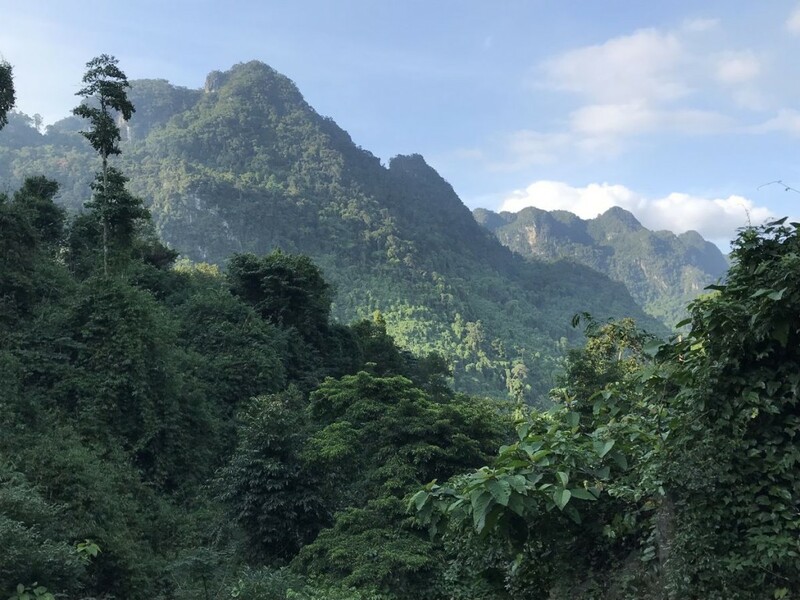 The bustling main road full of backpacker hostels, restaurants, tour guide services and cafes down in Phong Nha village has all sprouted like concrete mushrooms in the last five or six years (and Ben reckons new places are opening at the rate of several per month). I guess this is the sort of pattern that repeats itself wherever a couple of pioneers and few backpackers find something exciting to do in a backwater part of SE Asia. Some hostels spring up. 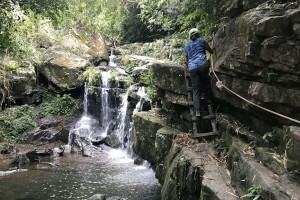 Some “activities” are identified, and tailored into day tours. Tour operators get their near-identical signboards and leaflets printed. Tourist restaurants blossom. The place gets into the Lonely Planet and then some shinier hotel options appear for the regular tourists. Coach tour operators start to include it on itineraries. Maybe someone in government thinks about some infrastructure. Ben was wry about the “development” in Phong Nha village. Most of the local families are taking out big loans and then just building cut-price copies of the backpacker hostels that already exist there – not realising that they’d do much better trying to offer something different. You only need so many bottom-end hostels. He knows the local bank boss, and apparently he’s mighty concerned about all these loans that have gone out! Especially as this year is suddenly so quiet. Still, it’s very cool to realise that this whole little centre of tourism and activity just basically didn’t exist less than 10 years ago. The Farmstay itself is 9km from the village, which in a different kind of place would seem nuts. But it means they’ve built a big, comfortable place on very cheap land, and in fact all of the cave activities – the reason why you come to Phong Nha – require jumping in a car or on a motorbike to get there anyway, so that’s no real problem. About the only disadvantage is that we’re eating at the Farmstay every night and the food is a bit on the meh side; their western food is a bit inexpert and their Vietnamese food a bit bland. 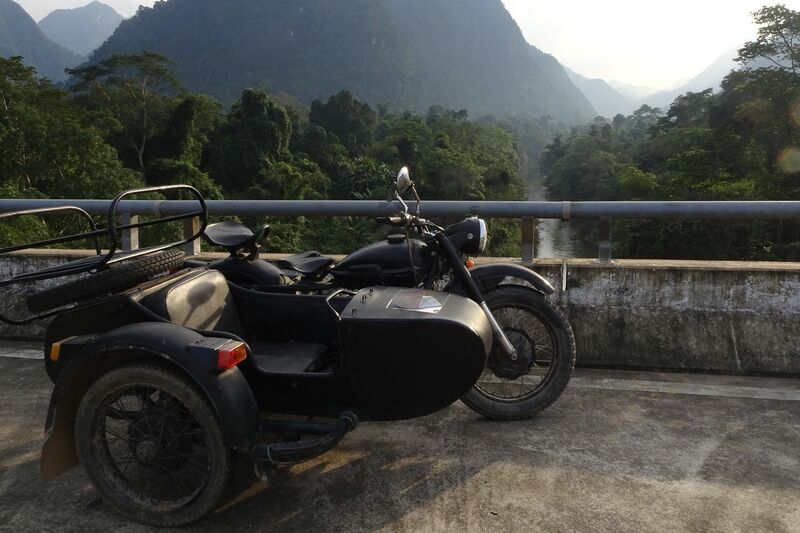 This afternoon we took Ben’s old Soviet sidecar motorbike (with driver! I’m not driving anything with less than 4 wheels again!) and headed into the National Park. 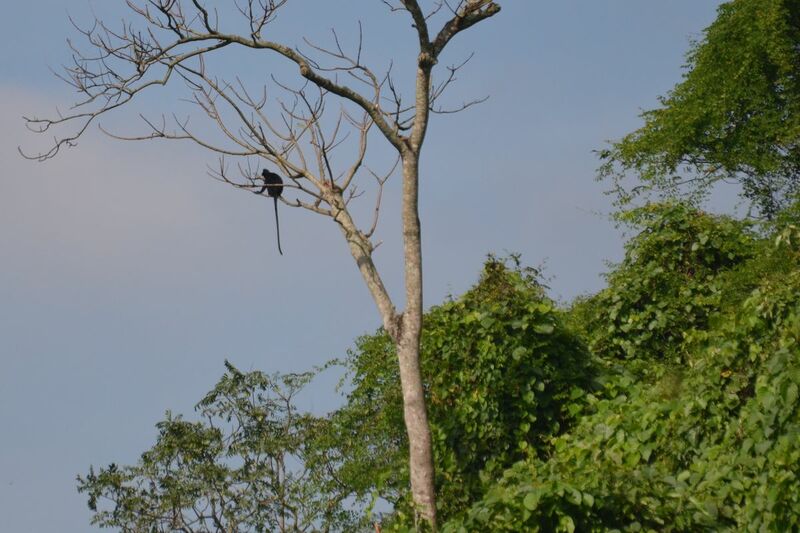 There was a stop at a semi-wild enclosure where rescued primates are kept before release, which gave us a good view of a langur as well as three species of macaque after a sweaty walk. Then a stop at the Botanical Gardens for crap lunch (National Parks, they never fail to feed you badly) and a walk to a waterfall that started on a fully paved path through the forest and then bizarrely became a scramble over slippery rocks with a rope to hang on to. So, we didn’t quite relax entirely. But at the end of the afternoon I spotted movement in a high tree and we stopped to see some distant Hatinh Langurs leaping about in the trees, just too deep among the foliage and pretty much on dusk to be able to photograph. This entry was posted on Sunday, December 9th, 2018 at 4:33 pm	and is filed under Vietnam. You can follow any responses to this entry through the RSS 2.0 feed. You can leave a response, or trackback from your own site. 15/12/18 - Wanna go home!